Tom Banton is declared fit and is included in the squad of the team while spin allrounder D Bess misses out. Jerome Taylor and Jamie Overtone are their pick of the bowlers in last 5-6 matches. J Overtone is currently highest wicket taker of the tournament. 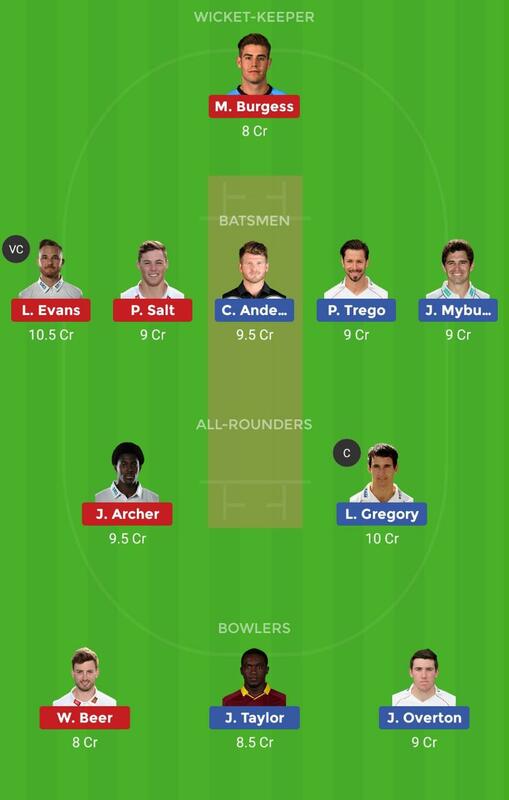 J Myburg will open the batting along with one of S Davis or T Banton.Chances of S Davies is higher but he will be risky. Sussex has declared same squad as of last match. Rashid Khan will not play as he has gone to his country. Philip Salt and L Wright will open the batting for them.Both are in good form and both scored halfcentury in 2nd last match. L Evans will bat at 1 down, He is the in form batsman of the team.